Intensely controversial plans to build a golf course on one of Scotland’s most precious coastal wildlife sites would be blocked in England, according to environmental groups. 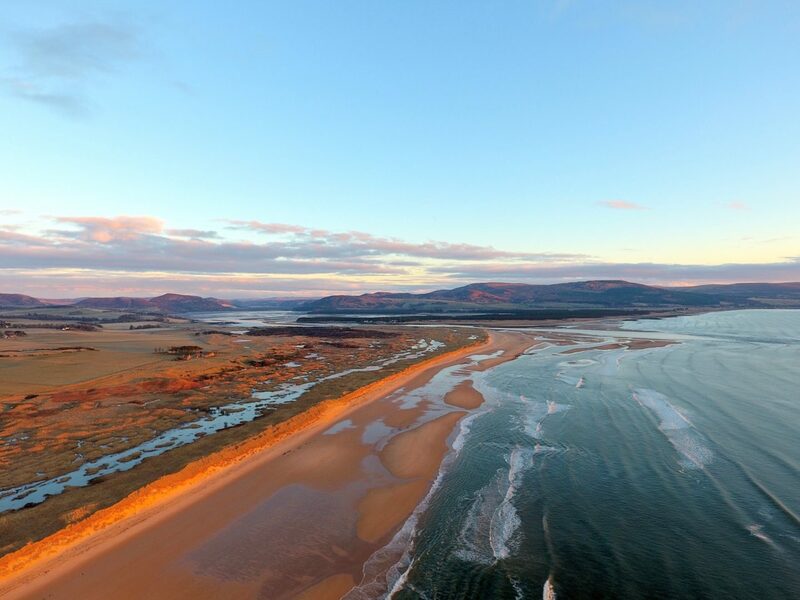 They warn that a proposed US golf development at Coul Links in Sutherland is being used as a “stalking horse” to wreck hard-won nature protection laws and allow developers to destroy more conservation areas across Scotland. But the US developer, Todd Warnock, accuses environmentalists of making “gross generalisations” that are “naive and irrelevant”. The golf course is an opportunity for “ecological enhancement”, he insists. Warnock, an investor from Chicago who lives in Dornoch, has teamed up with wealthy US golf developer, Mike Keiser, to propose a £10 million championship golf course at Coul Links, near the village of Embo on the northeast coast. But the area is protected from development under three different conservation laws because its unique sand dune network is home to rare and endangered plants, insects and birds. The plan has been supported by some local people, but it has been opposed by seven major nature conservation groups in Scotland and the government’s wildlife agency, Scottish Natural Heritage (SNH). Highland Council officials advised against it, but councillors ignored their advice and gave the golf course the go-ahead in June. Since then environmental groups have been urging Scottish ministers to call in the planning application for reconsideration, so far backed by over 12,000 people. At the end of July ministers extended their deadline for deciding what to do until 28 August. The Ferret reported in February that rural economy minister Fergus Ewing’s most senior civil servant, Liz Ditchburn, had earlier intervened “in a facilitative role” on the Coul Links development. She visited the site in 2017 and convened a meeting at St Andrew’s House in Edinburgh for the developers to present their plans to officials. In July 2018 the Coul Links developer described the “symbiotic relationship” between the golf course and the environment as “trailblazing”. This was “something that can be used as a template for future developments as well,” it said in a tweet. Conservation groups now fear that ministers may allow the golf course to go ahead and set a precedent for damaging other wildlife sites. The area is designated under the international Ramsar Convention, which they say gives weaker protection in Scotland than in England due to differing interpretations by Holyrood and Westminster. “There are number of extremely worrying strands coming together around the case of Coul Links which suggest that the project could be being used as a stalking horse to systematically undermine and weaken Scotland’s hard won nature protection laws,” said Aedán Smith, head of planning with the Royal Society for the Protection of Birds (RSPB) in Scotland. Smith warned that developers could try to exploit any weakening of European Union laws to protect the environment as a result of Brexit. “Where vested interests are circling to take advantage of the loss of European oversight for nature protection, it is vital that ministers do not allow this to happen and intervene to save this important site from needless destruction,” he said. Members of the Scottish Wildlife Trust (SWT) have expressed “shock and disappointment” that Ramsar sites in Scotland seem to have less protection than south of the border. “It is extraordinary to think that if Coul Links was on the north east coast of England it would be safe from development,” said the trust’s chief executive, Jonny Hughes. According to Dr Tom Dargie, an ecologist who chairs the local campaign group, Not Coul, the UK government position on Ramsar sites was unequivocal. “If Coul Links was in England the golf development simply could not be permitted because three basic requirements are missing,” he said. Campaigners have previously compared Coul Links to Donald Trump’s golf course at Menie on the Aberdeenshire coast. They said that ministers should learn the lessons from Menie, where another protected sand dune system was damaged. Warnock, however, strongly objected to the comparison with Trump, of whom he is not a fan. He highlighted Dargie’s previous role as an ecological adviser to Trump at Menie – though Dargie’s advice on how to protect the dunes there was rejected by Trump. “Not Coul, led by Donald Trump’s former ecologist, RSPB and SWT continue to demonstrate that they lack specific knowledge of the Coul Links site,” said Warnock. Warnock noted that there were no objections on bird habitats, which formed much of the regulatory framework of the various wildlife designations. “The only objection to the project is from SNH regarding 13.4 hectares of affected sand dune habitat,” he said. The Scottish Government promised to consider the protected status of Coul Links. “Ministers had an initial 28 day period to consider the application for a golf course at Coul Links after Highland Council notified them it was minded to grant planning permission,” said a government spokesperson. The extension will allow ministers “time to give full and proper consideration to whether this planning application should be decided at the national level,” the government argued. Photo thanks to Craig Allardyce. A version of this story was published in the Sunday Herald on 12 August 2018.